Most recent update: Aug. 31, 2017. To date, all updates have introduced only tiny quantitative changes to the original data, no substantive changes. A recent update adds an additional analysis (finite population confidence intervals). A second recent update slightly corrects the analysis of R1 vs non-R1 institutions because I originally misclassified one institution. Recently I decided to quantify the gender balance of recently-hired ecology faculty in North America. “Recent” being operationally defined as “hired in 2015-16, or in a few cases in 2014”. Data on the gender balance of faculty is widely available only at the level of very broadly-defined fields like “biology”. Current faculty gender balance mostly (not entirely) reflects the long-term legacy of past hiring and tenure practice rather than current hiring practice (Shaw and Stanton 2012; ht Shan Kothari via the comments). And nobody’s anecdotal experience informs them about the outcomes of more than a tiny fraction of all ecology searches in any given year. So this seemed like a topic on which many people would welcome some reasonably comprehensive data. Follow the link for more details on how I compiled the data. In that old post, I also conducted a poll asking readers what they expected me to find. Here are the answers: what fraction of recently-hired North American ecologists are women, and what do ecologists think that fraction is? I’ll follow a methods-results-discussion format. I checked over 250 300 ecology positions advertised in 2015-16, where “ecology” was broadly defined to include fields like wildlife ecology, fisheries, conservation, etc. (see the link to the previous post for details). The definition of “ecology” obviously is somewhat fuzzy, but a much narrower definition would’ve shrunk the sample size substantially while eliminating from the dataset many recent hires who self-identify as ecologists. Checking a given position often involved checking every assistant professor in the department. As a consequence, I sometimes stumbled across another ecologist who was hired in 2014 or later, in which case I added that position to the list. I included the occasional person I stumbled across who was hired in 2014 (rather than 2015-16) as a convenient way to increase the sample size a bit. I included positions at all colleges and universities, not just R1 universities. I included only assistant professor positions, not senior-level hires. In the end, I compiled 193 positions for which I could easily determine with high confidence that the position had been filled in 2014 or later by an ecologist (a small number of positions turned out to have been filled by people who weren’t ecologists even under my broad definition). In every case the gender of the person hired was clear from their name and photograph. I recognize that using a gender binary (male/female) isn’t ideal, but it seemed like the most practical choice. The remaining positions are those for which I couldn’t tell who was hired. In some cases perhaps no one was. Of those 193 recent hires, 105 (54%) were women. This is a sample, not a census. Assuming, not too unreasonably, that it’s approximately a random sample, the 95% confidence interval ranges from 47-61% women (normal approximation to the binomial distribution, which is fine here because the sample size is large and the estimated proportion of women is close to 50%). In the comments on the previous post, a couple of you asked if the numbers are different for research universities vs. others. The answer is it doesn’t appear so. 83 of the identifiable positions were at R1 universities or their Canadian rough equivalents. Of those, 47% were filled by women, meaning that women filled 60% of the non-R1 positions. The 95% c.i. are wide: 36-58% women at R1/R1-equivs. and 51-69% women at non-R1s. Both 95% c.i. include 50% (EDIT Aug. 31, 2017: no longer true after latest update) and the two proportions don’t differ significantly from one another (z=-1.80, p=0.07, two-tailed test). Note that the distinction between R1 institutions and others is somewhat arbitrary. If you were to define “research university” differently (say, as R1 + R2 universities, or not counting Canadian universities), you might get a different answer. Note as well that breaking down the results very finely (say, into all the Carnegie categories) would result in some small sample sizes. Aug. 13, 2017 update: Upon reflection, the confidence intervals in the previous paragraph are too wide, because they assume sampling from infinite populations. In fact, the population of positions is finite and not all that much larger than the sample. I checked over 300 positions, which is probably the large majority of asst. professor positions in ecology that were filled in N. America in the 2015-16 faculty job season. For instance, if you assume that the population comprised 350 positions, then as of this writing the estimated proportion of 54% women is surrounded by a finite population 95% c.i. of 49-59% (normal approximation). That’s a bit narrower on either end than the confidence interval in the previous paragraph. I did not break down the results by subfield. Personally, I think the sample sizes are too small and the definitions of subfields too fuzzy and arbitrary to make that a useful exercise, even just for purposes of data exploration rather than hypothesis testing. Plus, I didn’t have any a priori hypotheses and didn’t want to get sucked into data dredging. But if you want to look into that, you can download the data and go to town. I welcome corrections and additions to the spreadsheet; please email me (jefox@ucalgary.ca). I haven’t made the spreadsheet publicly editable, because I want to ensure the accuracy of any edits. I update the post periodically to reflect corrections and additions. We got 468 respondents, evenly split between men (50%) and women (49%), plus 2% who declined to indicate their gender (note: percentages may not add to 100% due to rounding). Respondents comprised an even mix of grad students (28%), postdocs (31%), and faculty (30%), plus 10% in other occupations such as government scientists. I don’t know the mix of fields they’re in, but based on past reader surveys and the fact that this is an ecology blog that was polling about hiring in ecology, it’s safe to assume the large majority are in ecology or an allied field. Obviously, this isn’t a rigorous random sample from any well-defined population. But I think it’s a sufficiently large and diverse sample of mostly-ecologists to be worth talking about. Sorry this is so ugly. If you want pretty graphs you should be reading Meg’s posts. The majority of guesses were off substantially, in three senses. First, over half the guesses were off by at least 10 percentage points, which seems like a fair bit to me in an admittedly vague and subjective sense. Second, and more objectively, only 43% of respondents (those who guessed anything from “43-45% women” to “58-60% women”) provided a guess that overlapped the 95% confidence interval of the correct answer. Third, the poll asked respondents to indicate their subjective confidence in their predictions. Specifically, I asked respondents to indicate what size of miss would surprise them (“I’d be surprised if the true value was X or more percentage points outside my chosen range”, where the choices for X were 1, 3, 5, 7, 9 or “other (describe)”). By their own admission, over 60% of respondents will find the result surprising. I used chi-squared tests to check for associations between variables. There was no significant association between respondents’ genders and their predictions (p=0.94). There was no significant association between respondents’ positions (faculty, grad student, postdoc, other) and their predictions (p=0.13). There was no significant association between respondents’ predictions, and their subjective confidence in their predictions (p=0.85). I think these data are very good news. I think they represent progress. You surely wouldn’t have gotten the same answer if you’d collected the same data a few decades ago (Shaw & Stanton 2012). As I hope is obvious, aggregate data like these don’t tell you anything about whether any particular search was conducted fairly, or whether any particular applicant for any particular search was evaluated fairly. They certainly don’t show that nobody ever experiences any gender bias during hiring. And I certainly don’t think they’re an argument for complacency about gender bias. Presumably, recent hiring is gender-balanced at least in part because the issue is taken seriously by many individuals and institutions. We shouldn’t stop taking it seriously. As I hope is obvious, these data don’t tell you anything about what’s going on at any other career stage (tenure, promotion, etc. ), or in any other context in which ecologists and their work are evaluated (e.g., grant and fellowship applications). As I hope is obvious, these data don’t tell you what individual ecologists experience in their day-to-day professional or personal lives, and they don’t substitute for or devalue discussions of those experiences. Conversely, I don’t think individual experiences substitute for aggregate data like these. I think both have important and complementary roles to play in discussion about bias and what to do about it. As I hope is obvious, these data tell you very little about your own personal chances of obtaining a faculty position in ecology, since your own personal chances depend on many other factors besides your gender. I lack other data that might aid further interpretation of these data. In particular, I don’t know the gender mix and qualifications of the applicants for any of the positions. And I don’t know the gender mix of all ecology postdocs. Just based on what I know anecdotally about the gender mix of ecology graduate students and postdocs, I’d guess that most faculty applicant pools in ecology are roughly gender-balanced. But I’m speculating, obviously, and I wouldn’t put much credence in my own speculations. These data are perhaps somewhat surprising in light of what’s known about the “leaky pipeline” at the level of broader fields like biology. Shaw and Stanton (2012) quantified the effect of “demographic inertia” on the gender balance at different career stages in broadly-defined scientific fields. Basically, what would you expect the gender balance of biologists at any given career stage (grad student, postdoc, asst. prof, tenured prof) to be in 2006 (the most recent year of data they examined), given the “initial” gender balance back in the 1970s and changes over time in the gender balance of biology undergraduates, assuming no gender bias in individual probabilities of transitioning from each career stage to the next? That’s the “demographic inertia” baseline (really “demographic inertia plus changing undergrad enrollments”), to which you can compare the observed data in order to discover and quantify gender-biased transition probabilities. They find that demographic inertia has a big effect on current gender balance, but at all career stages there are fewer women in biology than expected under demographic inertia. 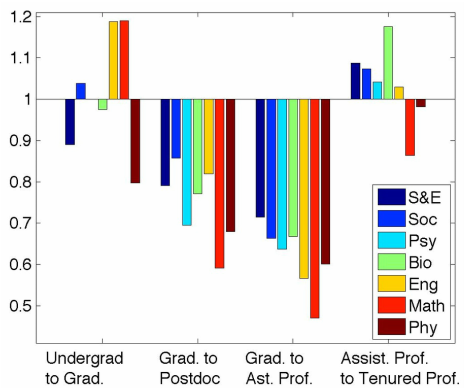 The difference is largest at the transitions from grad student to postdoc and postdoc to assistant professor. That is, they find that those transitions are the biggest “leaks” in the “leaky pipeline” in biology, with the leaks at other career transitions being small or non-existent (indeed, they find a modest “reverse leak” at the tenure stage). Reviewing the broader literature, Shaw and Stanton (2012) refer to the transition from grad school to faculty as the most difficult transition for women as compared to men. In light of that, it’s perhaps somewhat surprising that recent faculty hiring in ecology is gender-balanced. But as noted in the previous bullet, I lack the data to compare the gender mix of recent hires in ecology to the mix that might’ve been expected given the gender mix of postdocs in ecology. Further, ecology is just a small subset of all of biology. So any comparison between my data and the results of Shaw & Stanton (2012) necessarily is tentative and based in part on speculation. Finally, Shaw & Stanton’s estimates of demographic inertia and deviations from it only go up to the early oughts. Extrapolating the long-term trends in their data forward by a decade would shrink the size of the “leak” during the transitions from grad student to postdoc to assistant professor, and reduce or eliminate the tentative potential contrast between their data and mine. For me, the contrast between the poll results and the data illustrates the value of caution about extrapolating from one’s own anecdotal impressions. My own guess as to the proportion of women among recent faculty hires in ecology would’ve been almost spot-on, and I was fairly confident in it. But in retrospect I think that was just lucky and I shouldn’t have been at all confident in my guess as to how the data would turn out. After all, I didn’t really have much to go on. Just knowledge of the outcomes of a few recent hires, plus various highly-indirect and quite-possibly-misleading lines of evidence. Knowing some people who’ve served on search committees and how seriously they take fairness. Walking around the ESA meeting and feeling like there are more women than there used to be. Knowing that the gender balance of faculty in most STEM fields has been slowly improving. Seeing lots of discussions on blogs and Twitter of the importance of taking gender bias seriously, giving me the vague impression that lots of people take the issue seriously these days…In retrospect, I really appreciate the several respondents who wrote in that they wouldn’t be surprised if their guesses were off by >15-20 percentage points; I wish I’d taken the same attitude. I said earlier that it’s not unreasonable to think of the data I compiled as an approximately random sample from the population of all recent North American hires in ecology. But there are ways in which my sample could be a bit biased. In particular, bigger and more research-intensive colleges and universities tend to have websites that are more informative about their faculty, and faculty employed by bigger and more research-intensive colleges and universities are more likely to have personal websites and/or Google Scholar profiles. For this reason, positions at larger and more research-intensive places were more likely to be included in my compilation. It was harder to identify who (if anyone) was hired at smaller and less research-intensive places. So if hiring at smaller and less research-intensive places skews a bit more female than hiring at larger and more research-intensive places (and as noted in the results, there’s a non-significant trend in that direction), then my compilation may somewhat underestimate the overall proportion of women among recently-hired ecologists in North America. As always, very much looking forward to your comments. This entry was posted in Controversial, Issues, Women in science by Jeremy Fox. Bookmark the permalink. Speculation on bi-modality: Optimists vs. pessimists. Optimists might predict things are getting better in terms of gender equality, and would predict an even gender ratio of new hires. Pessimists would predict a male-bias in new hires. Note: I have no social science evidence do back up the idea that optimist vs. pessimist is a useful or common distinction in perceptions of fairness and equity! I have various other off-the-wall ideas. I wish I knew how often respondents read about or discuss gender equity issues on social media. But who knows, maybe there’s no correlation there either. Another not-mutually-exclusive possibility is that maybe a minority of respondents were aware of a decent amount of directly-relevant information that the majority are unaware of (e.g., papers like Shaw & Stanton or other papers on this topic). Speaking only from personal experience, I fell into the pessimist category in this poll for several reasons. 1) I tend to be a pessimist, or at least cynical. (Accordingly, I indicated little confidence in my estimation in the poll.) 2) There was recently some discussion on the jobs wiki about specific instances where people had seen implicit bias at work on search committees. 3) The recent US election’s highlight on sexism in our society. As a woman applying for faculty positions this year, the latter two were not pleasant to see/hear. Thanks for taking the time to share your thinking. I suspect you’re far from alone and that many poll respondents were pessimistic for similar reasons. Perhaps, rather than Optimists and Pessimists, more Conservatives and Liberals. Wildly generalized, the Conservative standard response would be that there is no problem to see here, which would put their guesses around 50%, and the Liberal standard response would be that there is obviously an injustice that needs fixed, which would put their guesses somewhere bleaker. In retrospect, it would have been interesting if you’d also asked them how much they thought global warming was going to affect their lives. Thanks for pulling these data together, Jeremy. Not an easy task. I wonder what the appropriate null model should be for this analysis. In my experience, undergraduate and graduate students in ecology are highly gendered skewed towards women. My undergraduate Ecology class is 60-70% women normally, and every department I’ve been in has more women graduate students than men. So the greater gender balance in ecology faculty positions may be a result of increased skew going into the pipeline. A 50-50 mix may still reflect the same bias as in every other field…but hard to know. Agreed Casey. IIRC, more than half of both undergraduate and graduate degrees in biology now go to women. I suspect the same is true if you narrow it down to ecology, because my own anecdotal experience is like yours. For instance, pretty sure in my own department the majority of EEB graduate students are women, though I haven’t gone to the trouble of checking. To get at this you’d need ecology-specific data on gender mix at each career stage, analyzed with the approach of Shaw & Stanton 2012. I’d be happy to do it if I could think of a reasonably-easy way to compile the data, but I can’t. Best you could do easily would be to look at the gender mix of grad students in some semi-random sample of departments (semi-random because I don’t know any easy way to define the “population” of all departments training ecology grad students, from which a random sample could be taken). As an aside, Shaw & Stanton is a very nice paper, as a non-expert on this literature I found it very helpful. It wasn’t that bad, really. Though I suppose your mileage may vary on how you define “not the bad” for a self-imposed task. I dedicated large chunks of the day for 3-4 days or so and just ploughed through it. This was really interesting, but I agree with the long list of caveats about what we don’t know. Also, there’s more to consider: what proportion of applicants are women? We often hear that more women than men are in grad school and the ‘softer’ life sciences – so perhaps the number of “entry level” fac hires should be even higher. And research exists (in other fields) demonstrating that women as likely to be hired but less likely to be awarded tenure, etc – esp at R1/elite institutions. So we’ll see how this plays out. And since I like my feminism intersectional, I think we also need to ask how this squares with other kinds of identities, especially in terms of representing the students faculty teach and mentor. Agreed. As I said in the post, I don’t know what proportion of applicants are women. It might well be >50%, in which case the appropriate “null model” would be >50% women among recent hires. Further, the 95% c.i. on the proportion of women among recent hires is 45-60%, so even if one knew the gender balance of the applicant pool with high precision, my data would be unable to reject the “null model” for a range of different applicant pool gender balances. If I’m reading Shaw & Stanton correctly, I don’t think that’s true for science & engineering as a whole. Have a look at their Fig. 3. What they call the “inertial effect” for the transition from asst prof to tenured prof has been >1 since the early 90s. That is, statistically, women asst profs in science and engineering in the US have been slightly more likely than men to become tenured profs since the early 90s. Their data come from big NSF surveys, so I doubt that’s a blip or a small sample size thing or bad data. It surprised me too to learn this. I’m not an expert on this literature, and perhaps I’m misinterpreting Shaw & Stanton’s analysis. All I can say is I think the data and analysis are solid, but I welcome comments and corrections. It’s shouldn’t be impossible to figure out the applicant pool ratio. Universities have this info, you just have to convince them to give it up. Probably most people would be brushed off, but if ESA got behind it, maybe? Hmm. Interesting suggestion. No idea what would happen if you asked a bunch of places for this info. Probably to get a decent number of responses you’d need to have some sort of formal, “official” organization behind the request. Maybe ESA. Or maybe a registered, IRB-approved study? I can’t imagine too many places coughing up that data if I just emailed them with a note saying “hi, I’m writing a blog post on gender balance of faculty hiring in ecology…” Especially since many places will probably be concerned that the numbers could potentially be used against them in a hypothetical legal proceeding. Wonder if anyone’s done this for any other field? Is there some precedent for this sort of request? Thanks for the extended paper shout-out! Re proportion of female applicants: I agree that this would be really interesting information to have. As Daniel and I were writing up this paper ~5 years ago, the anecdotal evidence we heard from people who had been on search committees was that women were under-represented in the applicant pool (compared to female PhDs). We’ve gotten feedback that there may be very different patterns for math versus for computer science, but unfortunately we can’t tease those apart for our study, since NSF groups math and CS for their data collection. Thanks for the additional info and context Allison! Much appreciated. Anecdotally, I too wouldn’t be surprised if math and comp sci have very different patterns that are obscured by the fact that they’re lumped together in the NSF data. Allison, did your result on tenure rates surprise you? Did it surprise readers of your paper? I’m guessing that the answer to that latter question is “yes, very much so”. Also, let me take the opportunity to say what I should’ve said in my previous comment: I really liked your paper. The analytical approach you took just seems like such a natural choice to an ecologist like me. Such a study was done in 2004-5 and described in the book “Gender Differences at Critical Transitions in the Careers of Science, Engineering, and Mathematics Faculty” available here: – also ref 28 in Allison’s paper. At least back then, in biology, women were 45% of PhDs, 25% of TT applicants, 30% of interviewees, and got 34% of offers. It’d be interesting to know the stats today in ecology! Cheers for the tip. Did you mean to include a link to the book chapter? Very interesting that back then, the “leak” in the pipeline at the PhD-to-offer stage was entirely at the PhD-to-applicant substage. Yes, the tenure rates were definitely surprising. Thanks — hopefully the paper would seem logical from an ecological perspective since both authors are ecologists. Jeremy – given that you have the list of schools that had recent ecology hires, I wonder if it would be worth asking a few, to test the waters, if they would be willing to send you gender balance of the applicant pool? Their responses could give you a sense of whether you’d need extra official support to get the data. I don’t think IRB approval would come into play, but ESA support could be helpful. We can only hope that the number of service hours are as equitably distributed. Cheers for this Terry. One thing I’m struck by in that dataset is just how much variation there is in how much service people report doing, but how little of the variation is explained by the authors’ regression model and the variables included in it (gender, race, seniority, field…). If I’m reading Table 3 correctly, the entire multiple regression model only has an R^2 of 0.07. (which as an aside surprises me as I’d have thought that seniority alone would explain more variation in service than that). So gender is explaining at most a tiny fraction of variation in service. And if I’m interpreting the estimated size of the statistically-significant partial regression coefficient for gender correctly, it’s a modest effect (though your mileage may vary on what constitutes a “modest” effect, of course). So yes, I agree that one doesn’t want to see a statistically-significant effect of gender in an analysis like that. I guess I’d just add that I’d want to talk about that statistically-significant effect and how to get rid of it in the context of also talking about the massive variation in service contribution that isn’t explained by gender (or seniority or race or those other predictors). How come some people–men as well as women–are spending massive amounts of time on service while others are spending none, with still others spending every amount of time in between? @ Terry – thanks for the link in your comment, a more classical study referenced therein now that I recall that discussion in light of this one. See the Chisholm reference from IZA. The “blind” portions of hiring processes is an interesting one. I think, first, we have to know whether the (historic?) gender bias is subconscious (I.e., men get hired because of some subconscious bias) or a form of systemic discrimination (I.e., something about the system that causes men to have more competitive CVs at the point of applying for a job). I say this because if it is subconscious then a blind CV would be functional but if it is systemic discrimination than women’s CVs would always be less competitive. In this case men would continue to be hired over women unless a conscious choice is made to hire equitably. I, personally, think it’s a mix of both so maybe it would solve some of the issues. Good comments, my own thoughts are along the same lines. Personally (and these are just personal views on which there’s definitely scope for reasonable disagreement) I tend to worry more about the effects of past systemic biases, and so worry about blinding possibly baking in those effects. In particular, the results of Shaw & Stanton (biggest “leaks” in the leaky pipeline are the transitions from grad student to postdoc to asst. prof) suggest to me that childbearing and young child rearing often is a hit to women’s CVs (I emphasize that’s a speculative interpretation on my part). If the applications are unblinded, there’s at least the potential for the search committee to make allowances for that. Conversely, I tend to worry about subtle biases the most at the on campus interview stage. That’s when subjective factors like which candidate comes off as most likable, or energetic, or most brilliant, or most “ready”, or the best “fit”, or etc. tend to loom largest. I think it’s when considering those sorts of factors that subtle biases are most likely to shape the search outcome. And at that stage, subtle biases can’t be mitigated with blinding, they can only be mitigated by being consciously alert to them and via appropriate formal procedures. Re: the gender balance of recent hires maybe being “unintentional”, I guess it depends what you mean by “unintentional”. In part, this gets back to the question of the gender mix of applicant pools and what your “null model” is. If in aggregate the gender mix of recent hires matches that of applicant pools, then I suppose you could call that “unintentional”, though personally I think it would be better described as the outcome of intentional, conscious efforts to conduct searches fairly and professionally. Further, at many places there is a conscious effort by institutions and their search committees to hire more women. I don’t think that aggregate data like these, in the absence of any other data, allow one to evaluate the success of those diversification efforts. But they do exist. I was wondering if you looked at the positions by their seniority? From the reading I’ve done on this, women are doing well at getting early career positions, it’s climbing the academic ladder that’s still the problem. EDIT: As I said in the post, all the positions I looked at were assistant professor positions. One could look at hires for senior-level positions, but one wouldn’t learn much, unfortunately, because there are so few hires at senior level. The data on tenure rates in Shaw & Stanton go to this for biology as a whole. Women asst profs in biology actually have higher odds of becoming tenured than men do. I’m not aware of data (as opposed to anecdata) for climbing to the highest ranks. Promotion to full professor, attainment of dept. headships, attainment of endowed chairs, attainment of leadership positions within national academic societies, membership in national academies, etc. But I’m sure many of those data exist. Jeremy, are you aware of the study by Williams and Ceci 2015? I just stumbled upon it. It is the only experimental study of gender bias in tenure-track hires post-2000, where the evaluators are also tenured professors, that looks at fields other than psychology. It seems to suggest that women are actually preferred over men with equal qualifications 2:1 by tenured professors (except in economics where preference was gender neutral, 1:1). If men are more likely to apply for tenure-track jobs, and women are preferred 2:1, this might lead to the 50:50 ratio in observed hires [lots of assumptions made in that statement]. Seems possible, but impossible to tell without data on the pool of candidates. Perhaps I shouldn’t have been so surprised about the above data after-all. The authors suggest that the gender disparity in math intense STEM fields is most likely due to inequitable practices outside of the direct and implicit bias during the hiring process. Yes, I’m aware of it. It made a big splash at the time and was quite controversial. I suggest googling for discussions of it. My own view is that that study had some fairly serious problems that likely biased the result, and that some of the most vociferous criticisms were overblown (no, those two views aren’t mutually exclusive). More broadly, I find this literature difficult to read and interpret. It’s politically charged and my impression as an outsider is that it seems to be divided into camps who disagree deeply about things as basic as the definition of key terms (e.g., “bias”). Combine that with the fact that a lot of people seem to be doing studies that pretty small and have pretty obvious limitations (because a “perfect” study that directly addresses the question of interest would be impossible), and you have a recipe for ongoing, irresolvable arguments. But I’m no expert on this literature, so it’s quite possible that my overall impression has been unduly skewed because I happen to have read some small and non-random sample of the literature. Personally, I’ve found papers like Shaw & Stanton, and data like those I compiled in this post, to be the most helpful to me in thinking about this topic. Just because they speak directly to the issue we ultimately care about: career outcomes.